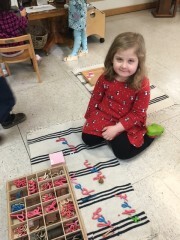 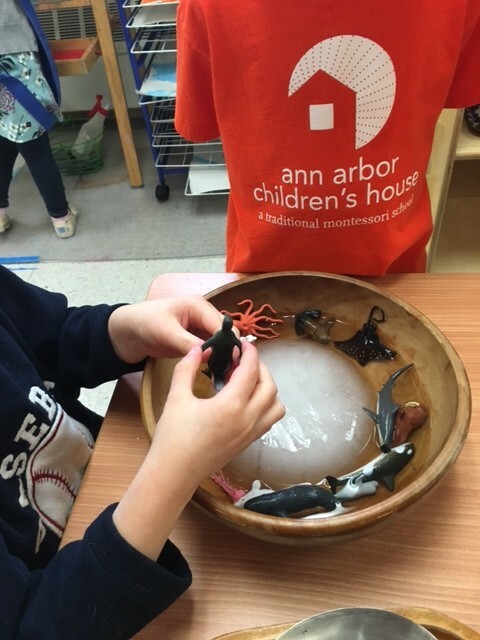 Search for annarborchildrenshouse on Instagram to see several posts a day! 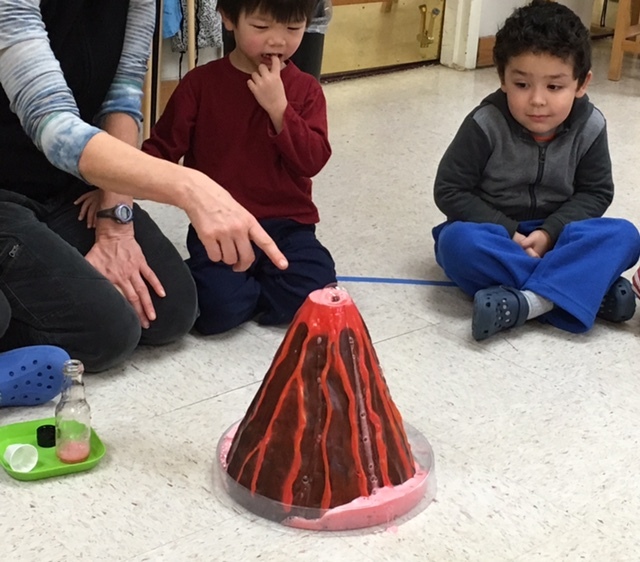 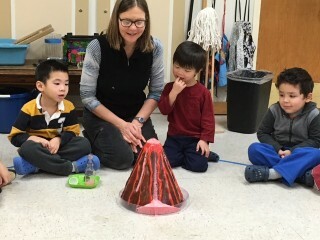 We love to study volcanoes! The children enjoy watching the eruptions and talking about the different parts. 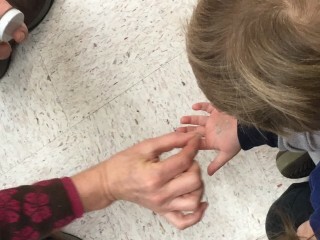 We also had volcanic ash that the children could touch. How tall are you compared a penguin? 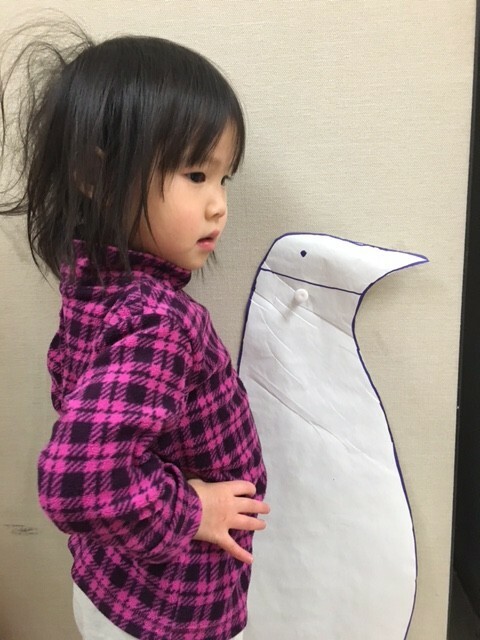 Some penguins are a lot taller than we thought they would be! 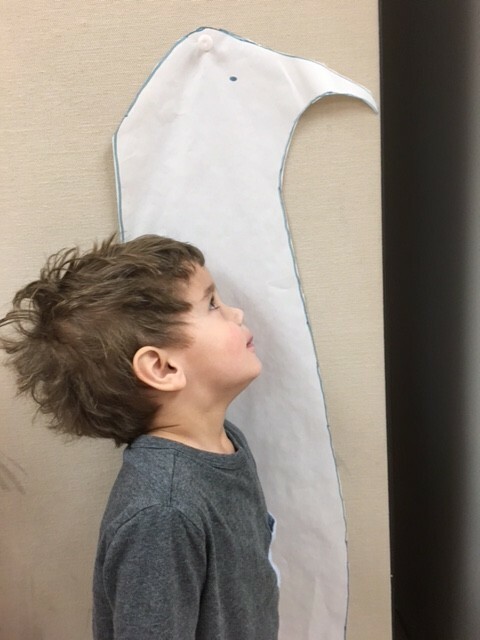 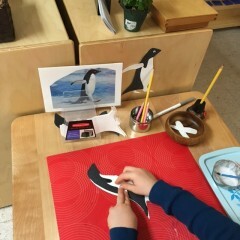 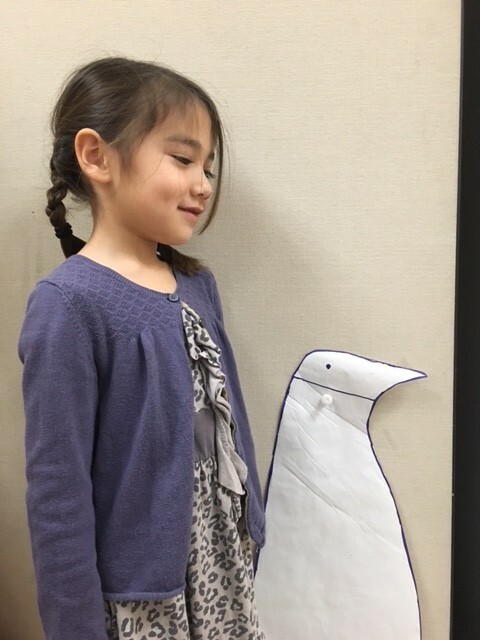 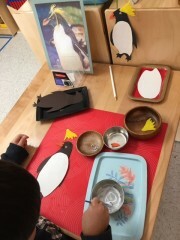 We studied several types of penguins and would put the cut out shape in actual size on the wall. 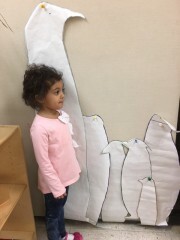 The children would line up to see how big they were compared to each one. 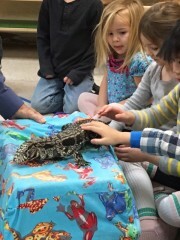 It was very fun to see! 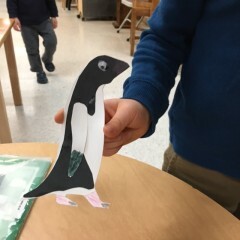 The children also enjoyed making their own penguins to take home. 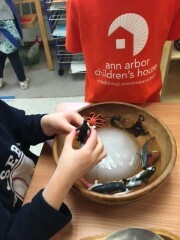 We have been learning about Antarctica for the past few weeks and have enjoyed interacting with ice! 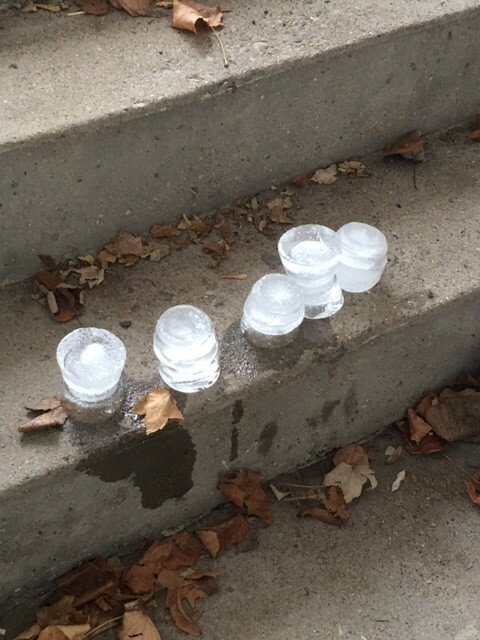 Ice is a big part of this amazing continent. 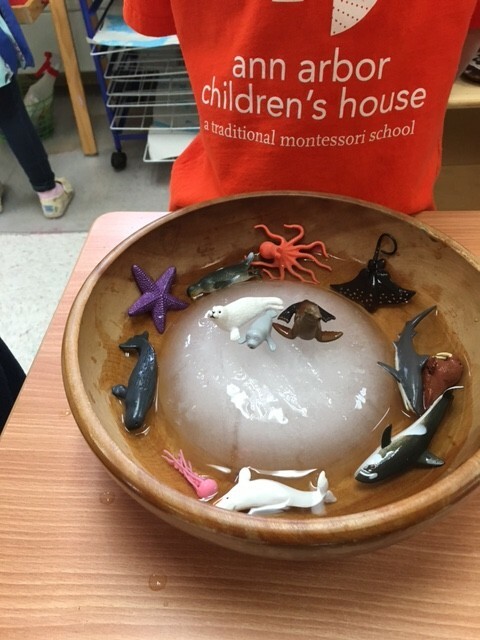 We wanted to make ice sculptures and our recent low temperatures helped! 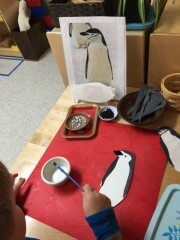 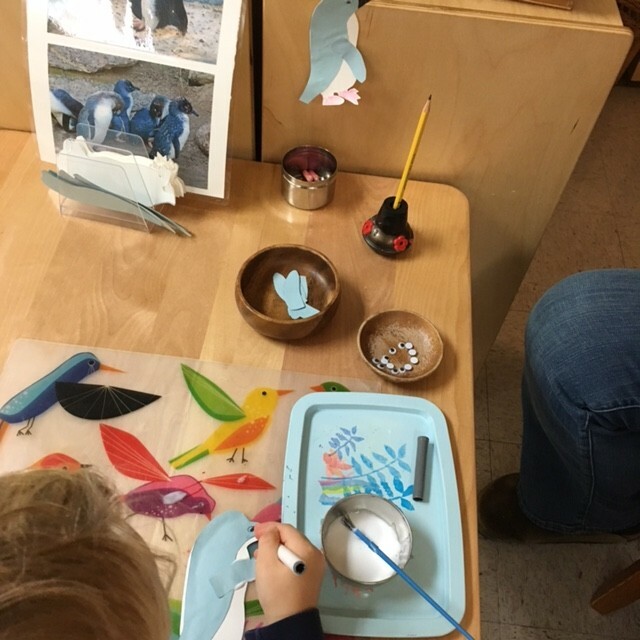 The child chooses two containers prepared with ice and takes them to the art table. He takes them out of the containers and then sprinkles kosher salt on one. 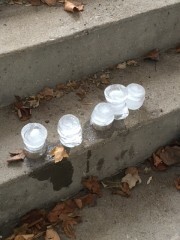 The second one is placed on top. 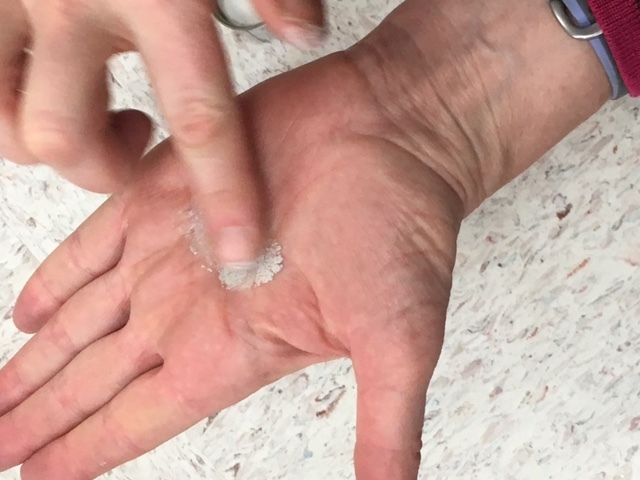 The salt helps melt the ice and the two pieces stick together. The child can spray water on top to make it shiny and change the shape a bit. 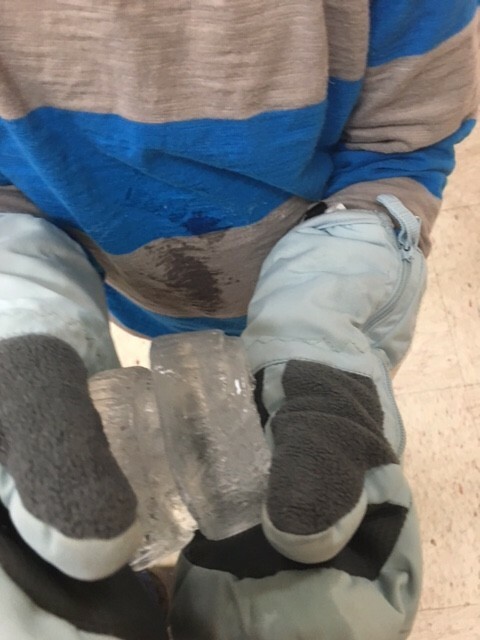 Mittens are used to carry the ice outside to refreeze. 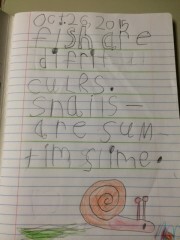 Here they are glimmering in the sun. On the playground, the ice can be used to create a sculpture. Also, when learning about Antarctica, we like to have fun with small plastic animals that live in the region. 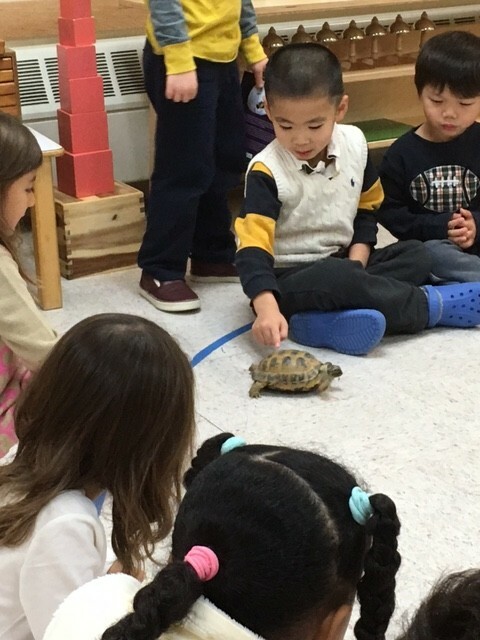 The children can interact with ice and the animals. 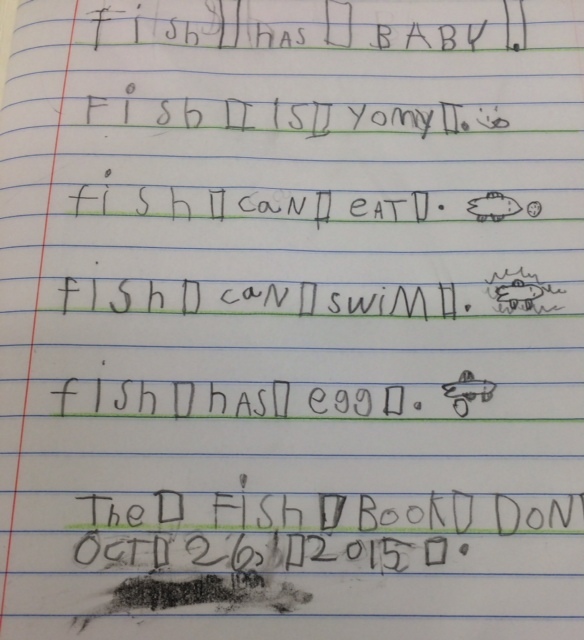 Some animals live in the water only and some go on land and water. 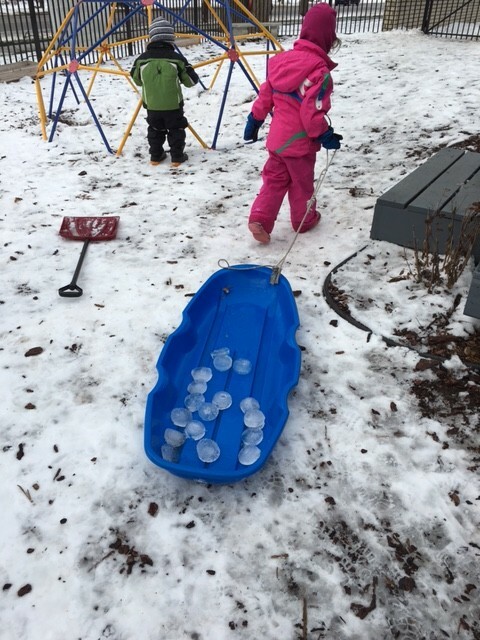 Ice and cold can be fun! 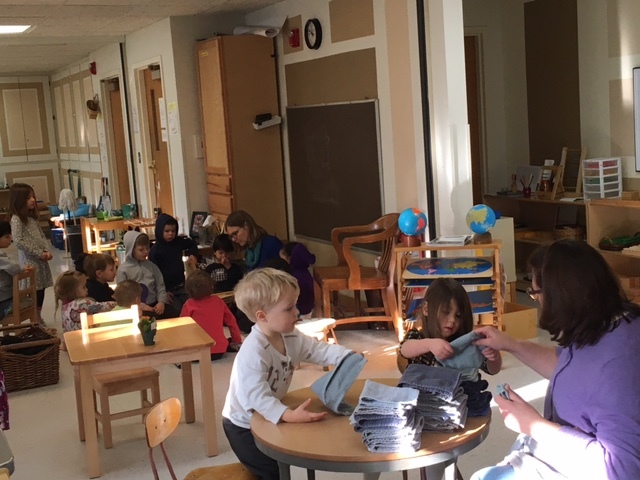 A small group lesson in the background and new children learning how to fold towels. 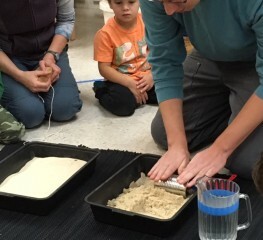 A lesson on the layers of the Earth. 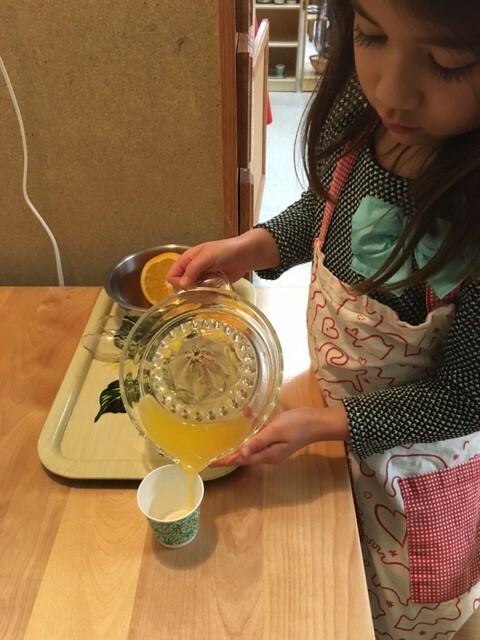 Food prep work- orange juice squeezing. 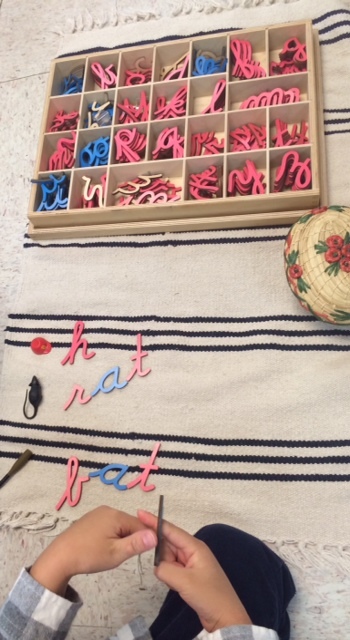 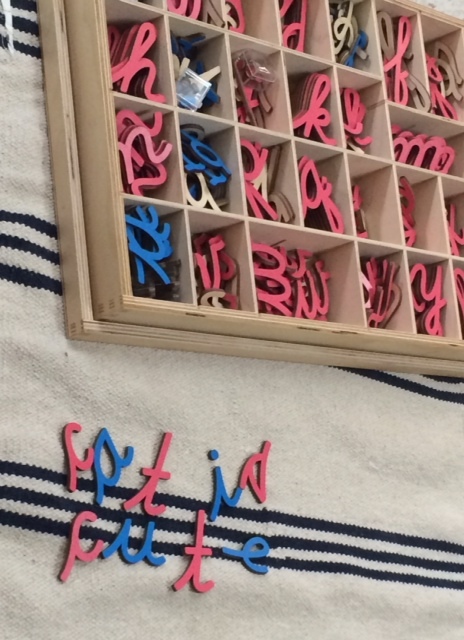 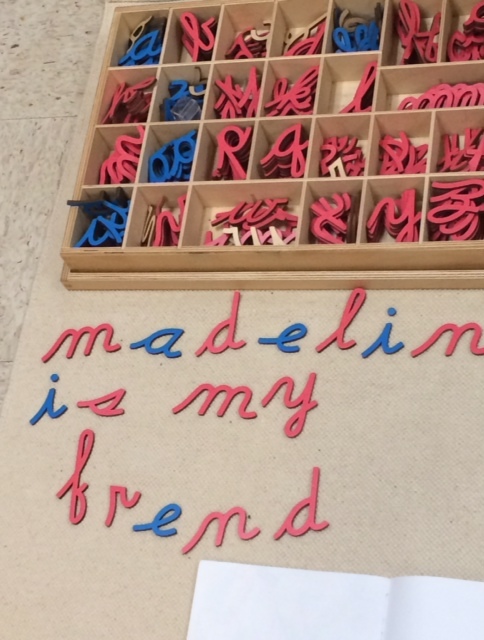 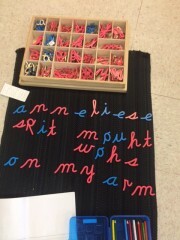 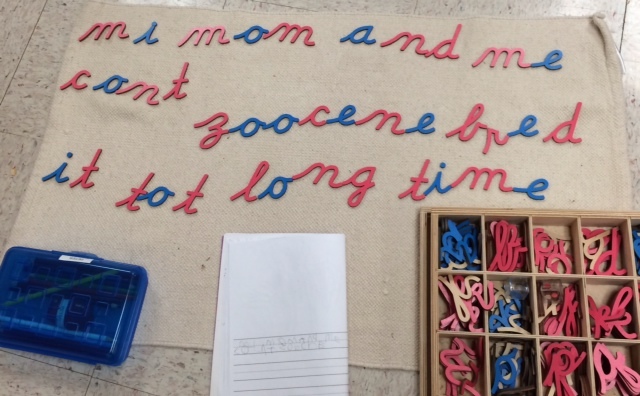 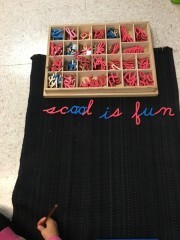 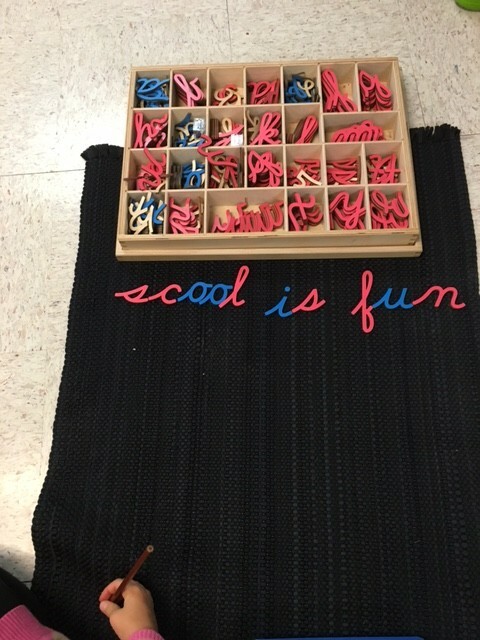 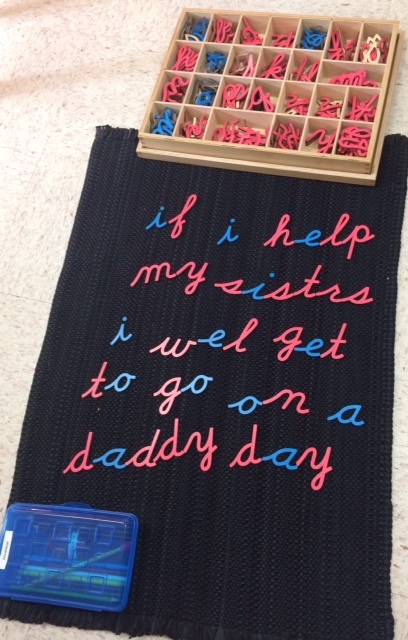 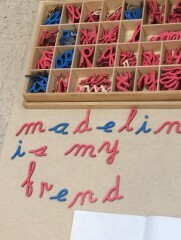 Writing words with the moveable alphabet. 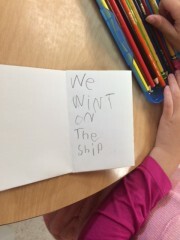 Writing happens on a daily basis in our classroom. 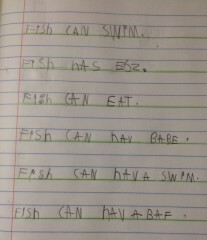 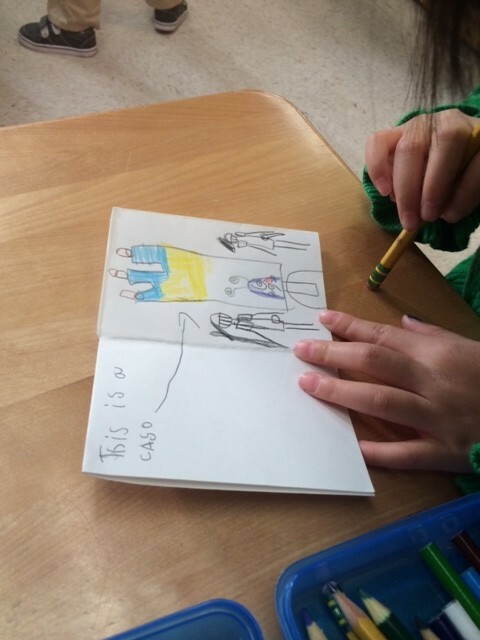 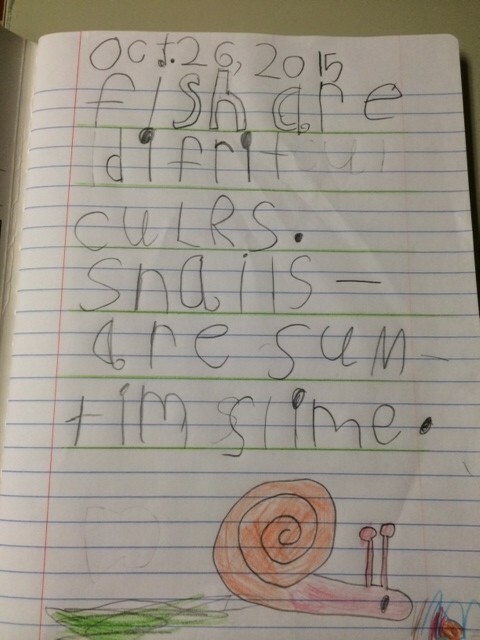 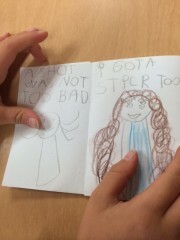 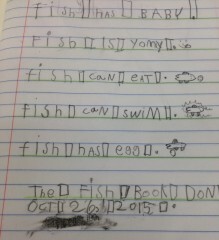 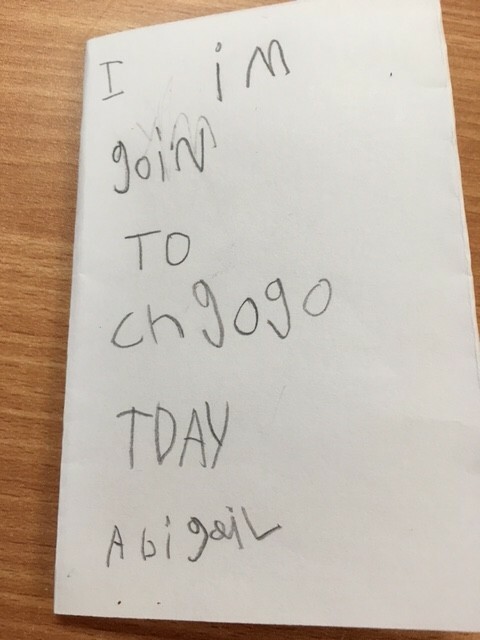 There are many different ways to write and different stages of writing. 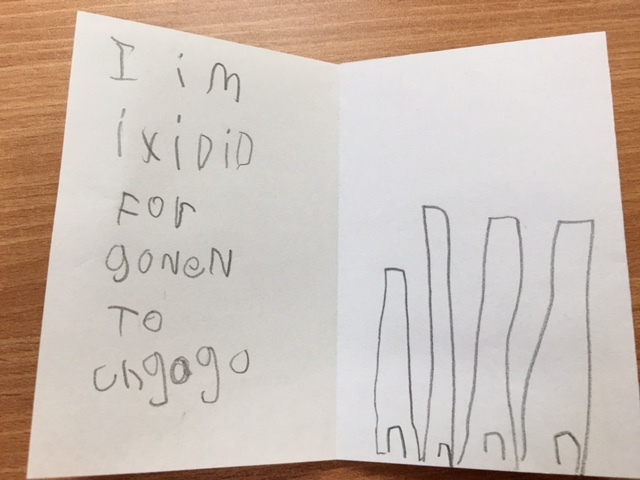 The children were asked to donate lentils and beans. 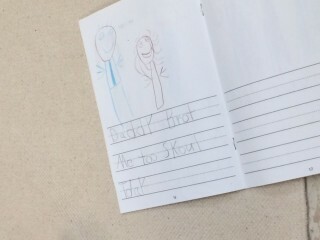 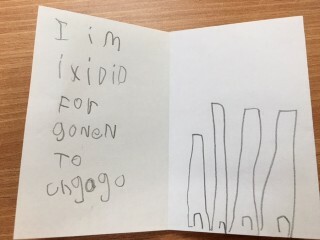 The Kindergarten children crafted a letter and sent it to all of the parents. 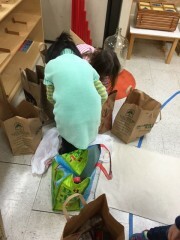 They received the donations and sorted them into bags. They then took the bags to the BDFP one day and met with two volunteers. 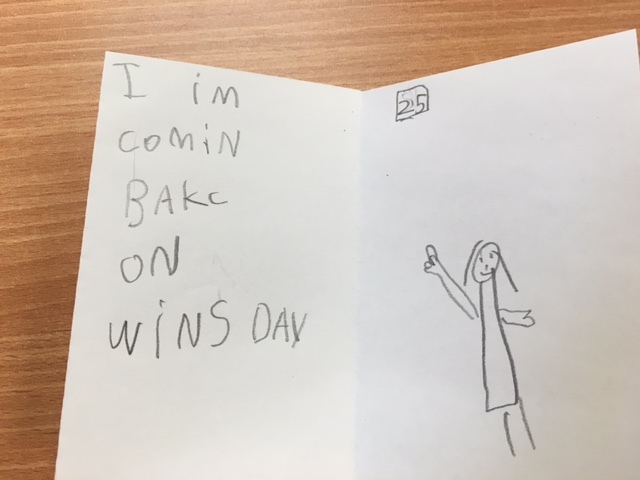 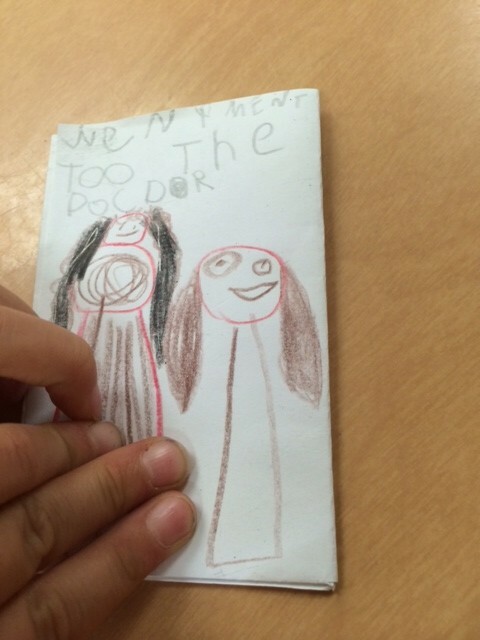 The children then received a thank you letter. 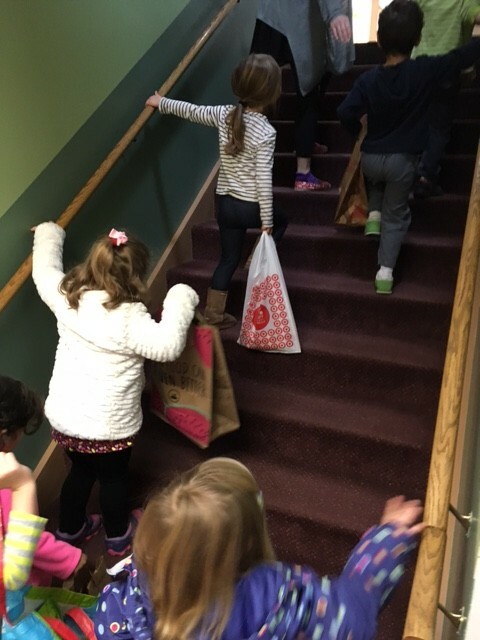 Please thank all of the 13 pupils who brought bags of donations to the BDFP last week. We received 30 assorted bags of dried beans, including at least 8 different varieties, and some raisin snack packs.On Thursday all of the beans were put out on the protein distribution shelves and were eagerly selected by patrons . 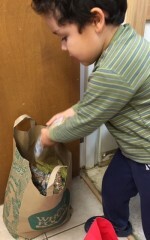 The raisins were selected by a family with several youngsters who love raisins. 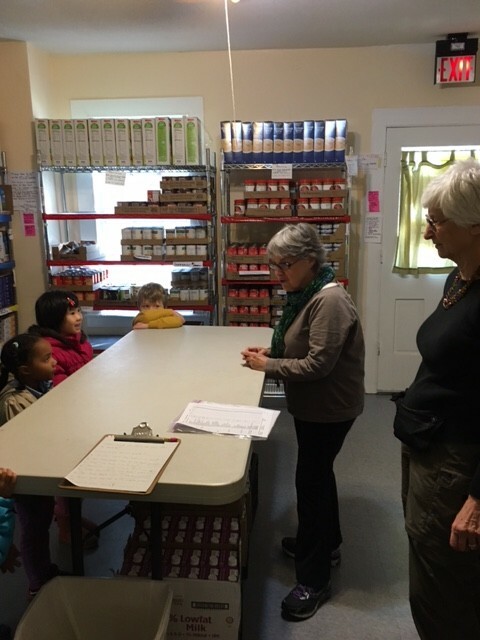 We are really delighted that you were able to bring a group of the older pupils to the pantry twice this month with other teachers helping as well. 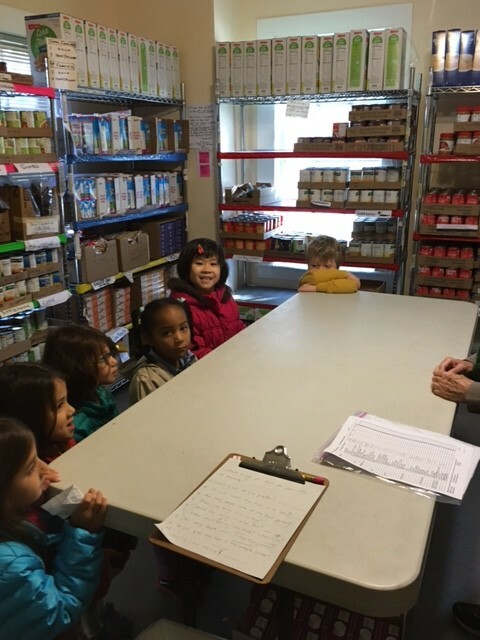 The children seemed excited to have the experience of visiting the BDFP and learning about how to help contribute to the food we distribute to our patrons. 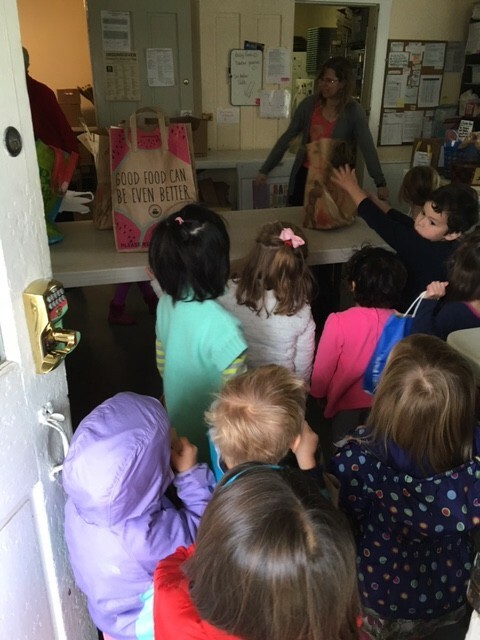 Thanks go also to the parents who responded to their children’s request to purchase some food to donate. 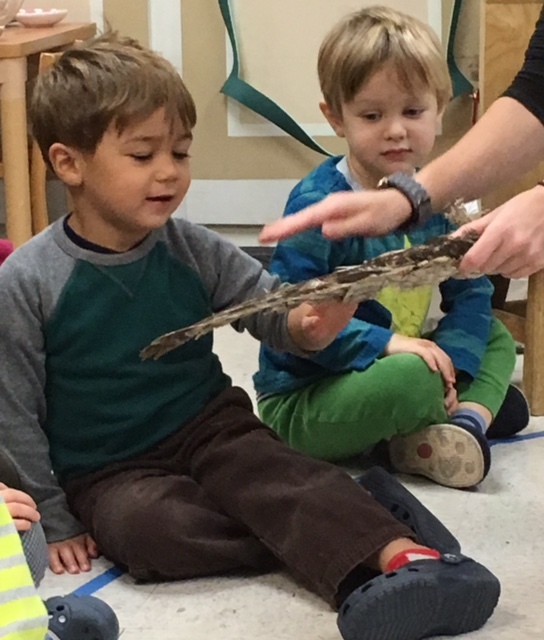 Feel free to contact us about scheduling other classes for a tour in the future. 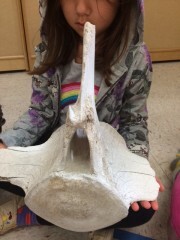 We start out our study of vertebrates looking at the difference between those with backbones and those without. 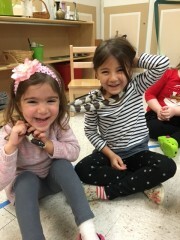 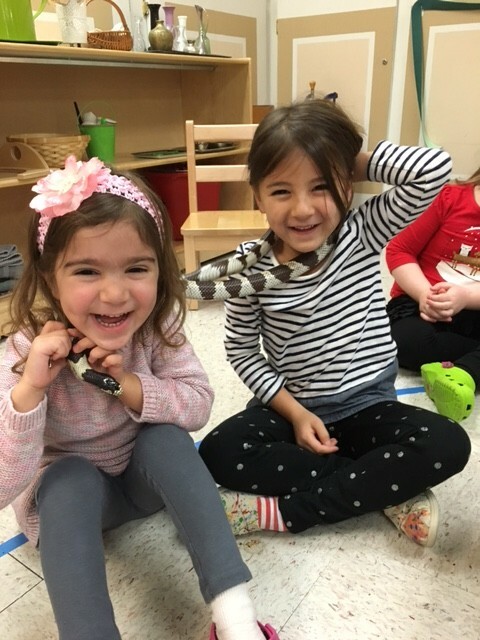 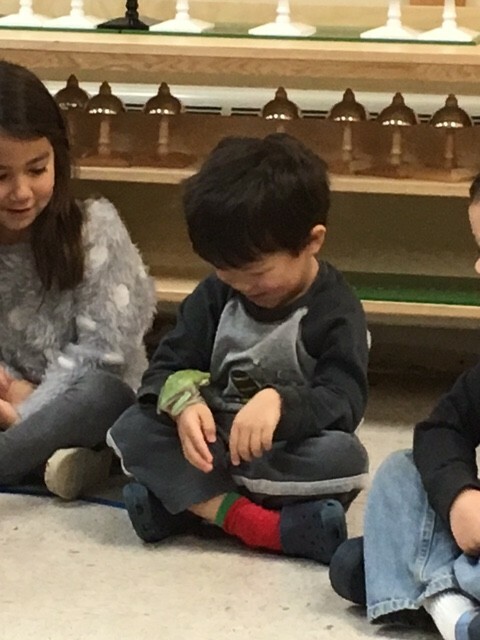 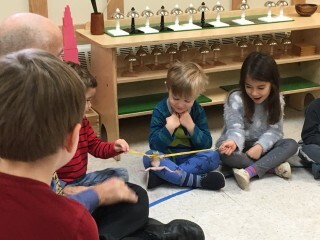 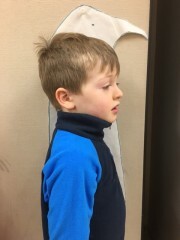 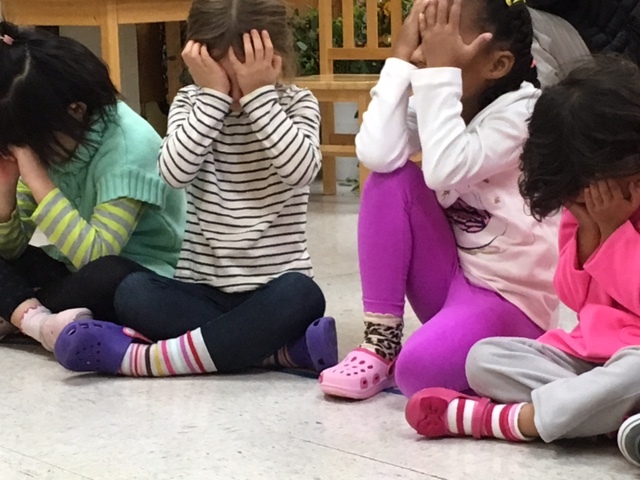 The children can feel their backbone and see that they are a vertebrate. We had an example of a very large vertebrae from a whale! 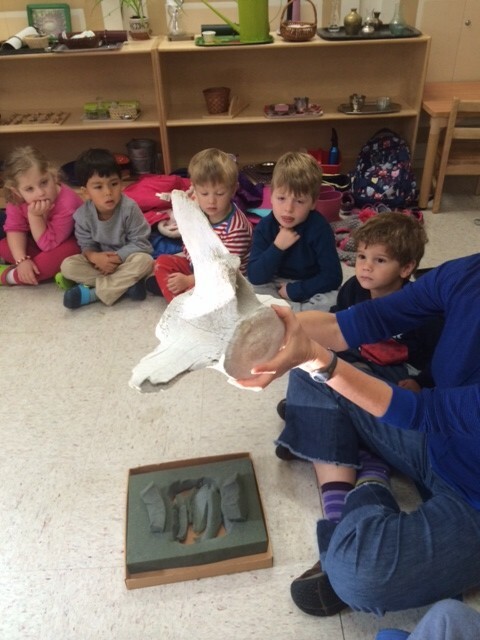 The children liked to feel how heavy the whale vertebrae was. 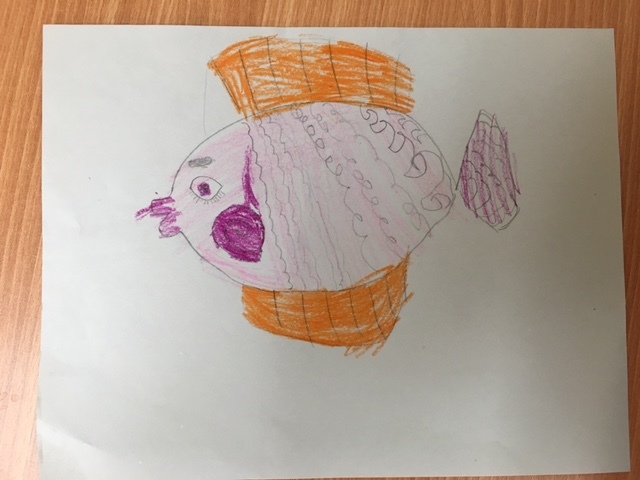 We have a fish in our classroom that lives with us so the children can experience it everyday. 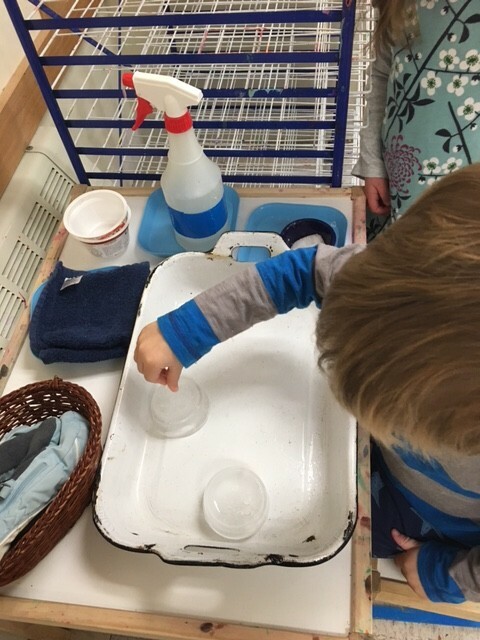 We take care of our fish by feeding it and cleaning out the tank. We also enjoyed making fish prints with this fish mold. 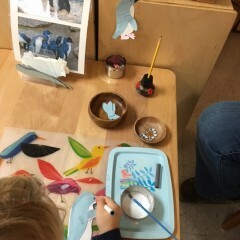 First paint the fish with watercolor or tempra paint. 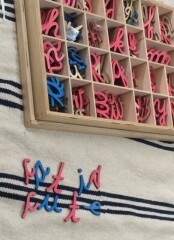 Put the paper on and push down. 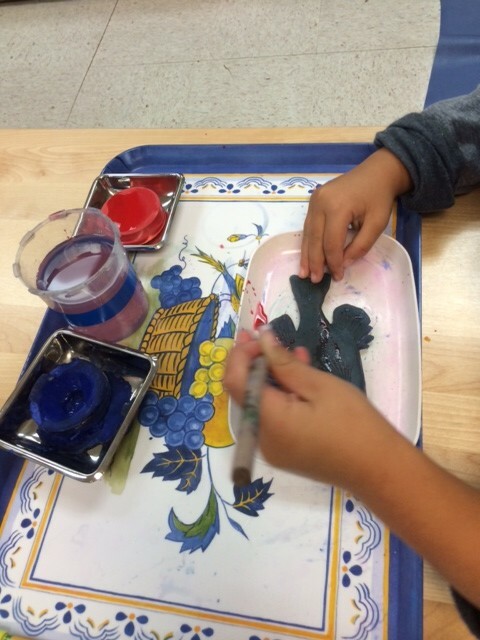 This absorbs the paint and when peeled back, looks like a fish print! 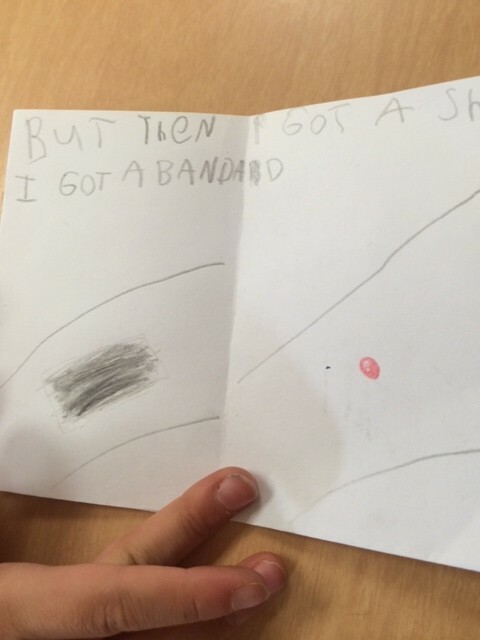 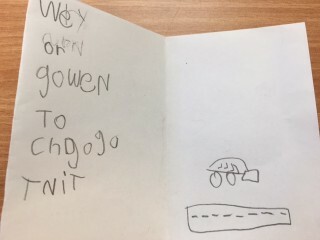 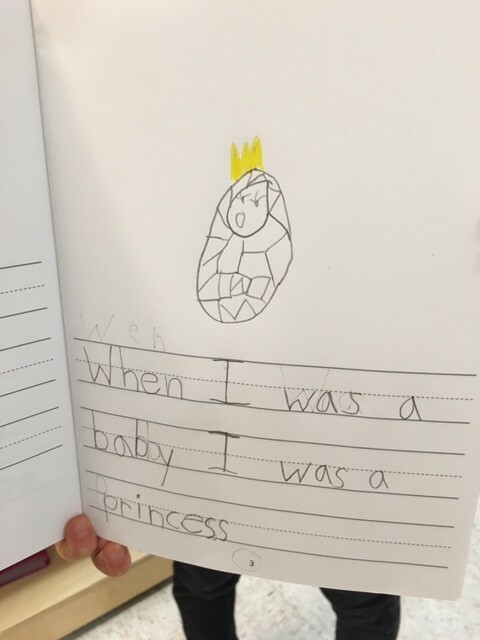 A child also drew a picture of a fish. Another vertebrate we have studied has been birds! 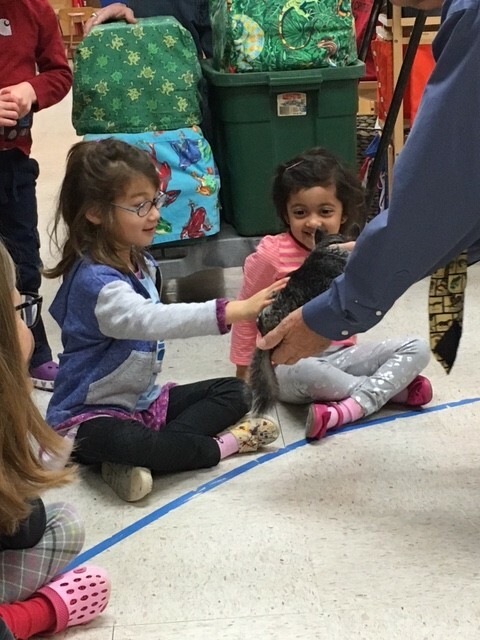 We had a special owl come and visit from the Leslie Science Center one day. 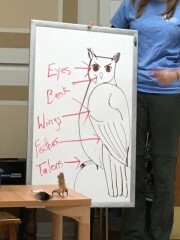 We talked about some of the parts of an owl. We did an experiment to see if we could hear a whole owl wing flapping vs. one bird feather. It was determined that the owl wings were silent to us! 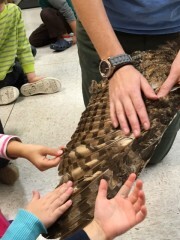 Owl wings are quite soft too! 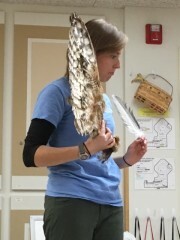 The guide took the owl out of the travel box! 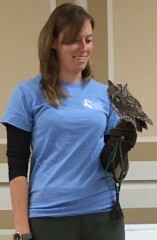 Some children correctly guessed that this is a screech owl!. 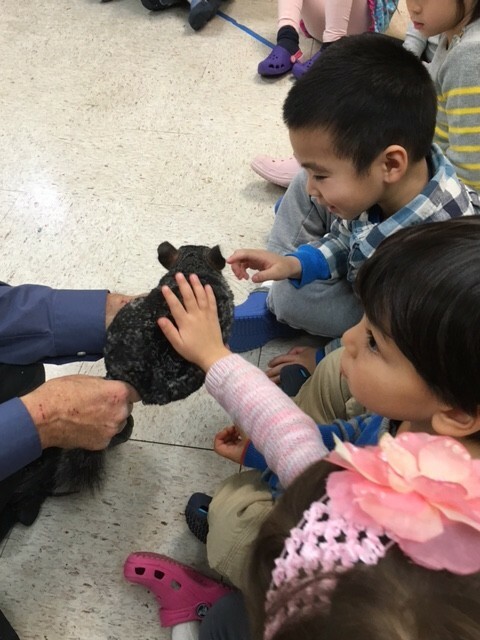 Thank you to Leslie Science Center! Boris the Tortoise came to visit us again this year. 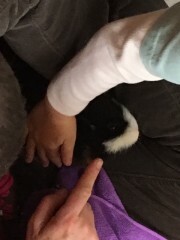 He belongs to one of our children’s families. 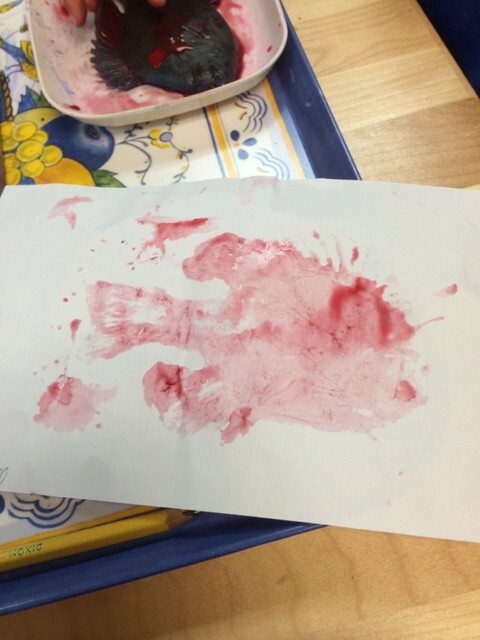 We learned about Boris and what he likes to eat. 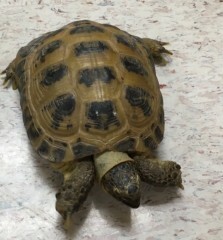 He moves quickly which was surprising to some! Why does he pee on the floor? Why does he have a band aid on his neck? We learned that Boris is from Asia and lives on land (grasslands). 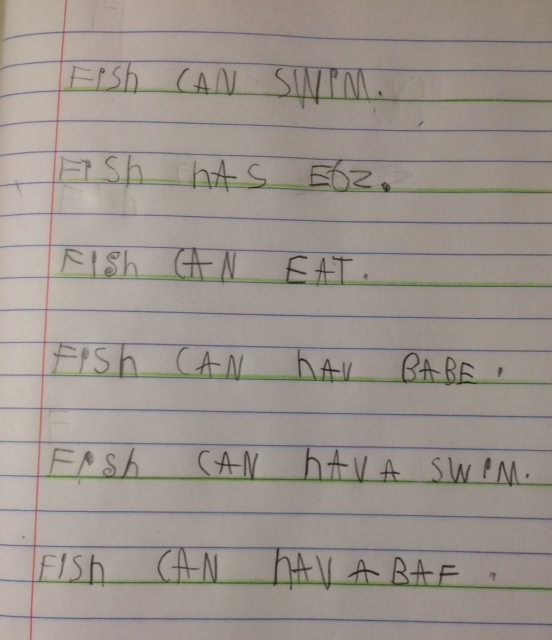 He can hold his breath in the water. 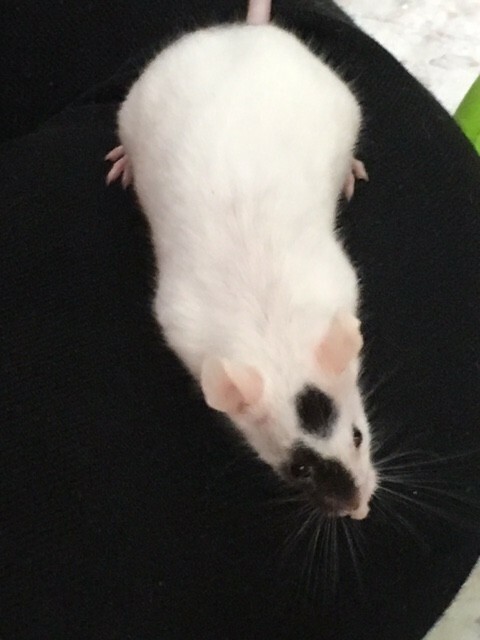 Boris likes to burrow and is vegan but can eat insects. Lettuce, raspberries, blueberries and carrots are his favorites. 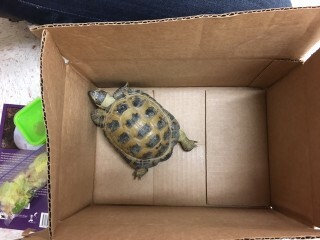 He can hibernate at 45 degrees and sleep for 6-7 months but he never has. Thank you so much to Peter and Melissa!! 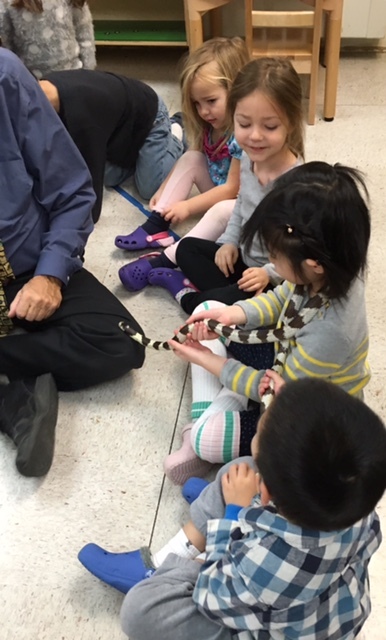 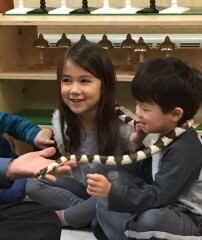 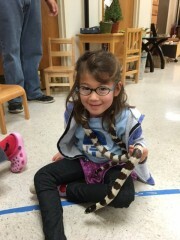 The children were also exposed to reptiles by looking at a fake snake and then examining a real snake skin. We didn’t have a special amphibian visit our classroom this year but we have two who are our pets. 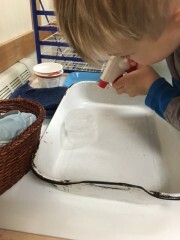 The children help to take care of and feed two dwarf water frogs. 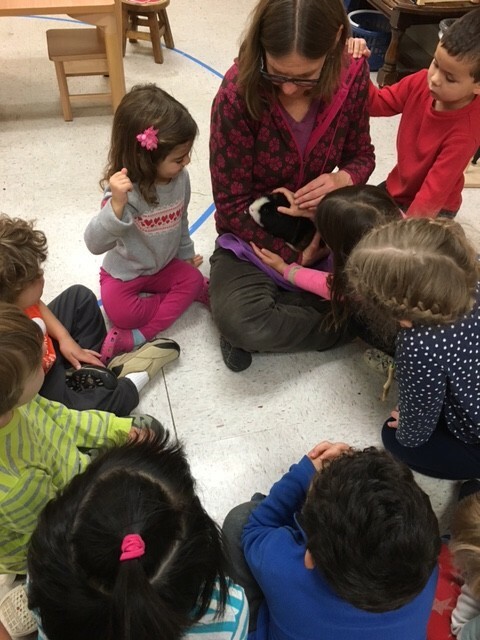 We like to have a mammal live in our classroom so the children can help to take care of it. 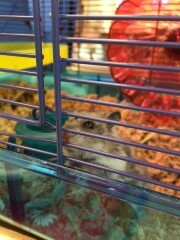 We have had a hamster for the last few years and the children like to observe and feed him. 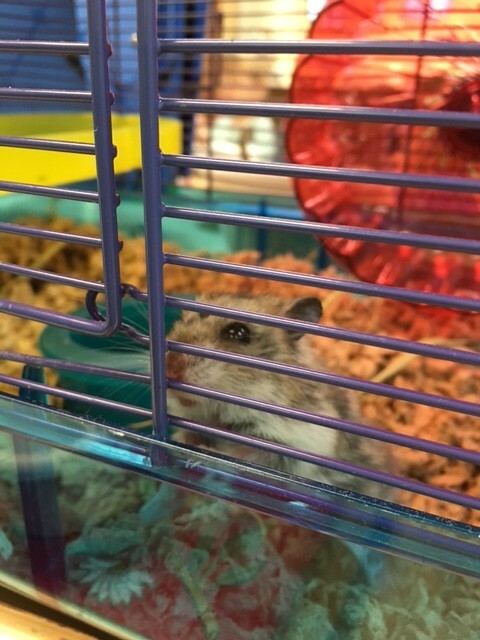 Sadly our most recent hamster passed away about two weeks ago. 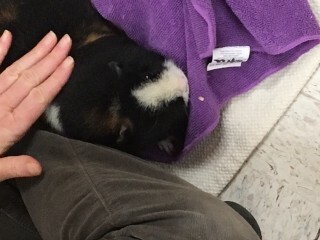 He lived a long hamster life of two years and we had a special meeting to discuss what happened. This gave the children the opportunity to ask questions and discuss their feelings. 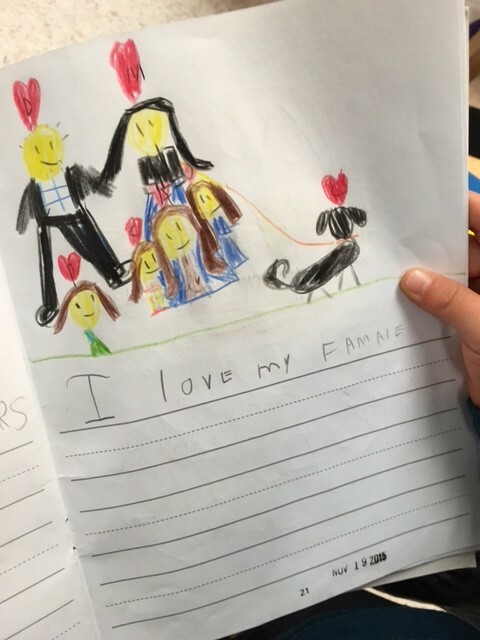 Many children made pages for a memory book about the hamster. We also had a guinea pig visit the classroom for a day. 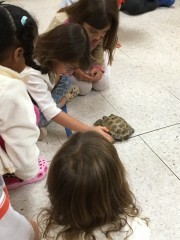 The children really enjoyed petting it and feeling it’s soft fur. 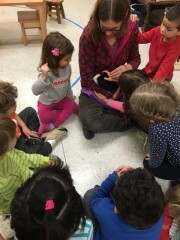 They learned that mammals give milk to their babies that are born live and have hair or fur. They also enjoyed watching the guinea pig eat lettuce. 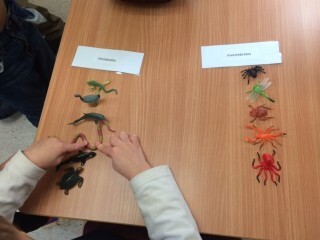 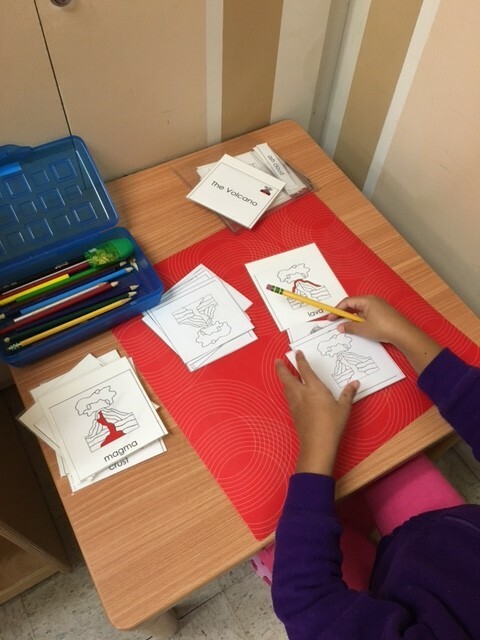 After the children learn about the five types of vertebrates, they spend time classifying the different types. 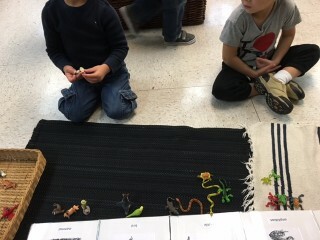 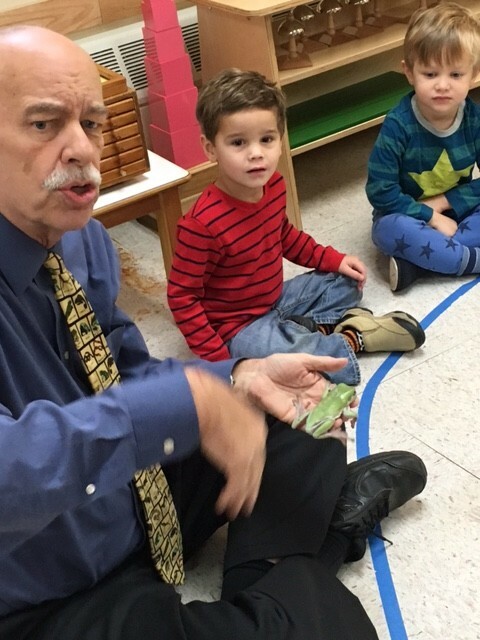 We do this with help from small plastic animals and a pictorial representation of each class. They think about the characteristics of the vertebrates and place them under the photo. 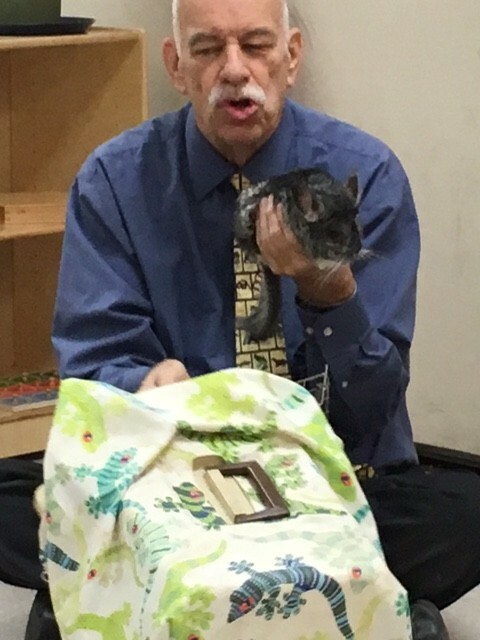 We also have a visit from the Critter Guy to wrap it all up. 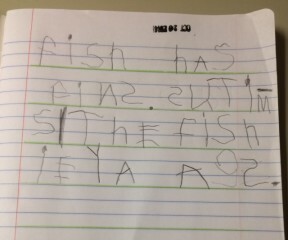 He brings at least one example from each category except a fish. 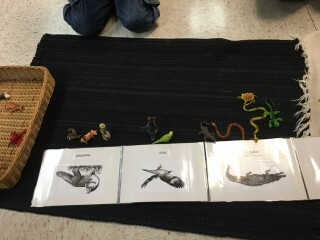 Paul (aka “the critter guy”) brought two examples of amphibians. 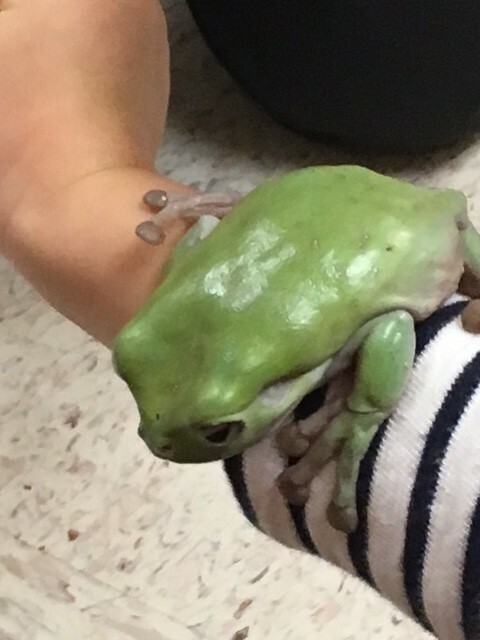 First was the tree frog. The second amphibian we had not experienced before. 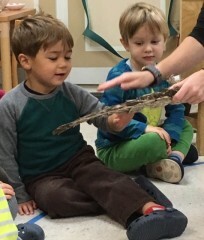 This one was a salamander. 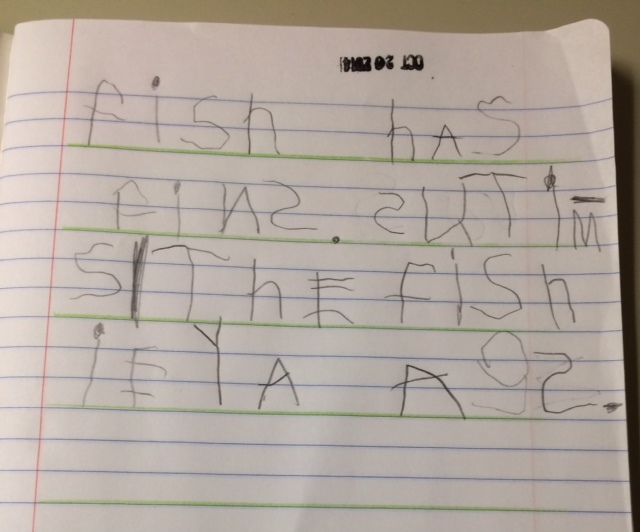 It lives in Mexico City and lives in lakes. 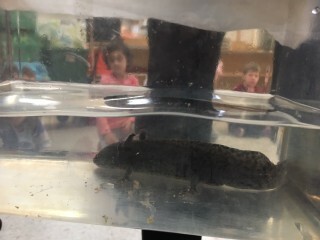 These types of salamanders do not lose their gills to develop internal lungs. Paul brought two types of mammals. 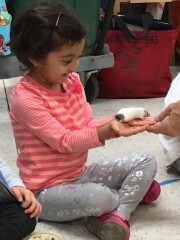 First up was a nice mouse. 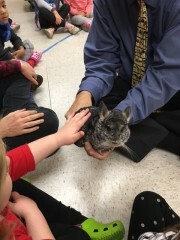 Next was a super soft chinchilla! 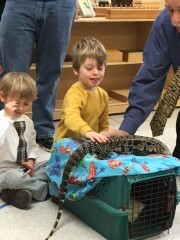 The reptiles were a Tegu lizard from the rainforest and a King snake. 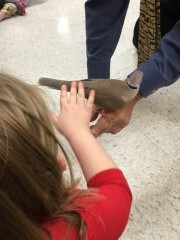 And the Doves returned. 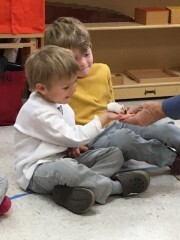 This time Paul brought an egg as well. 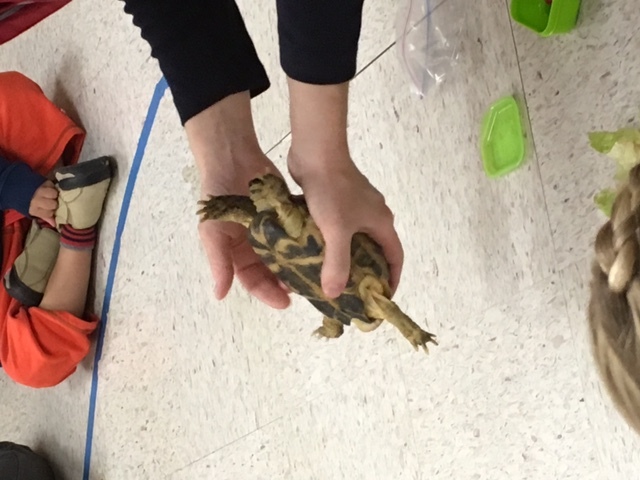 We really enjoyed our visit from various vertebrates. 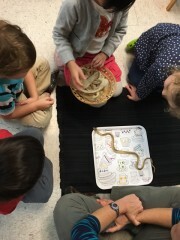 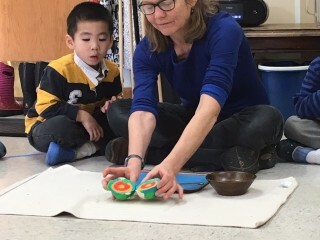 It is so fun to learn about the five types by having hands on experiences. 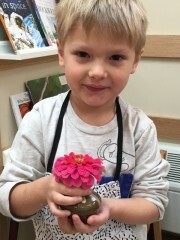 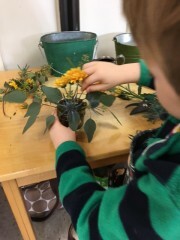 Flower arranging is part of a traditional Montessori school. 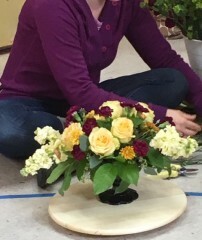 On Monday we usually get a bouquet of flowers and put them out at the flower arranging table. Children are given a lesson on how to complete this task. 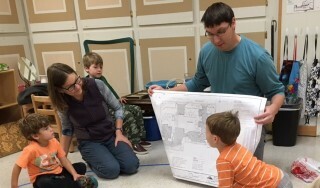 It involves many steps and young children are quite attracted to the whole process. 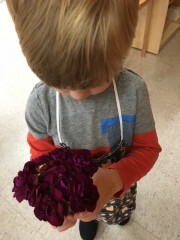 First the put on an apron, fill the small water pitcher, get a vase and a doily and choose the flower to be “arranged.” Usually they put one flower in a vase (after it is properly trimmed) and place that vase on a table. 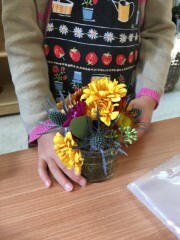 They notice that the classroom looks beautiful when they are finished. 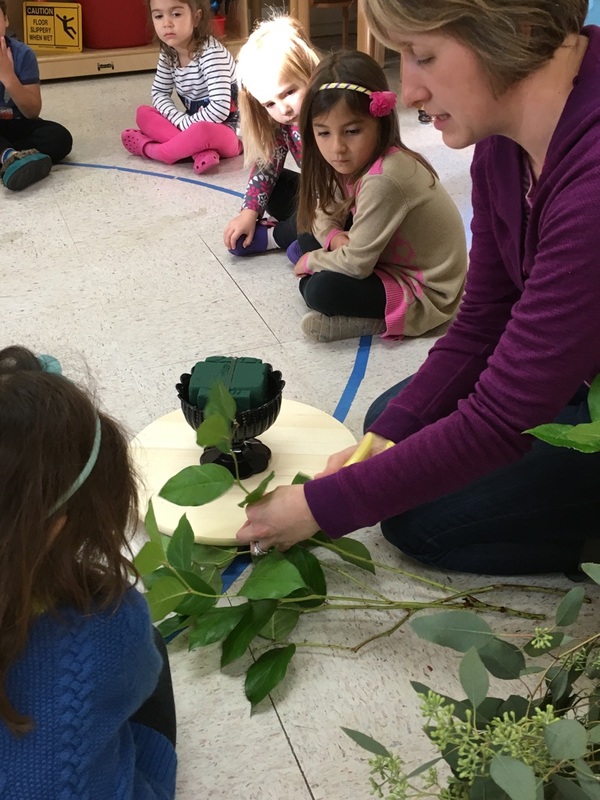 This past week we were lucky enough to have a parent who is also a Montessori trained teacher come to give us a lesson in flower arrangements. 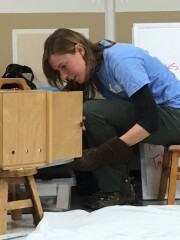 Melissa has been to many workshops and classes to learn this skill. 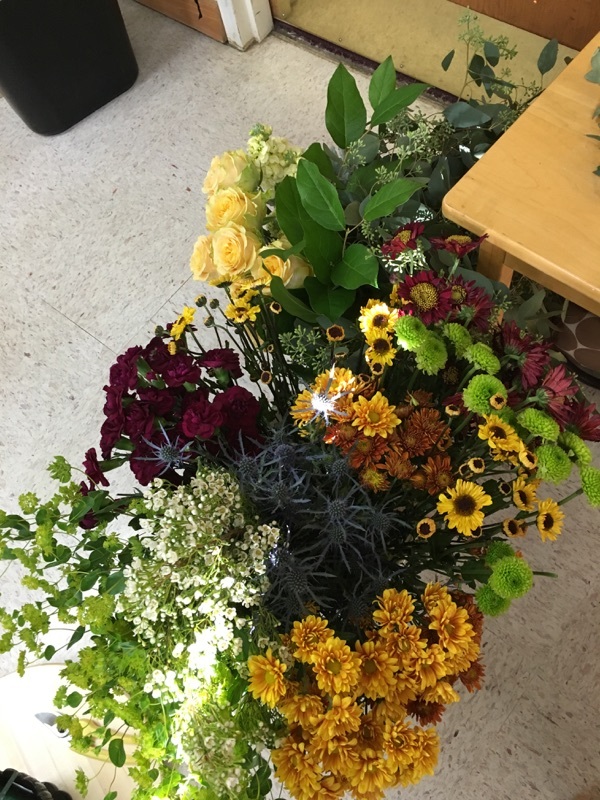 Melissa brought in many types of flowers. 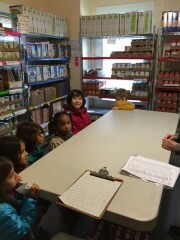 She showed the children how to choose the ones to begin with and them trim them down. 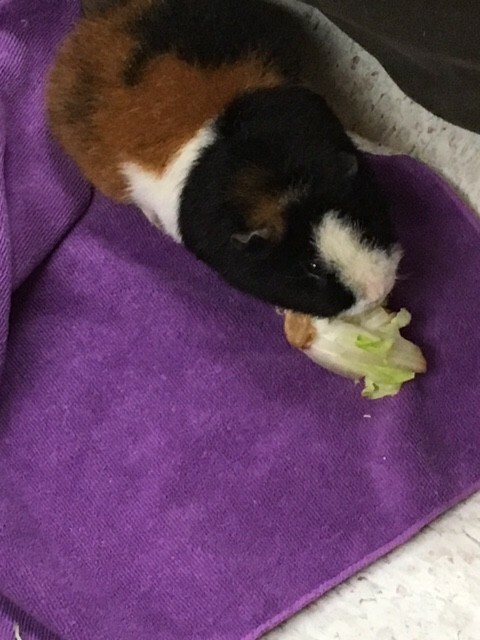 Start with the greens and begin at the bottom. 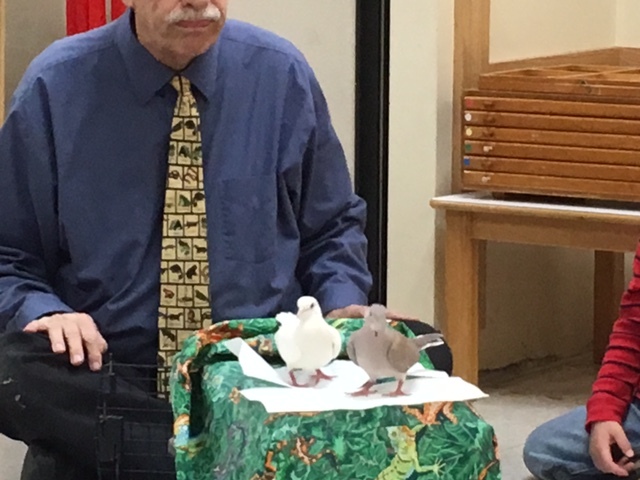 The children were captivated by this lesson. 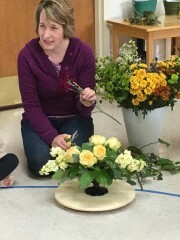 Melissa demonstrated just how they should cut each flower. Melissa created this beautiful arrangement for our classroom. She also graciously prepared many small mason jars for the children and left all of the flowers so they could practice this skill all week. 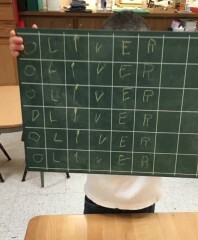 Some of the children absorbed so much of this lesson. 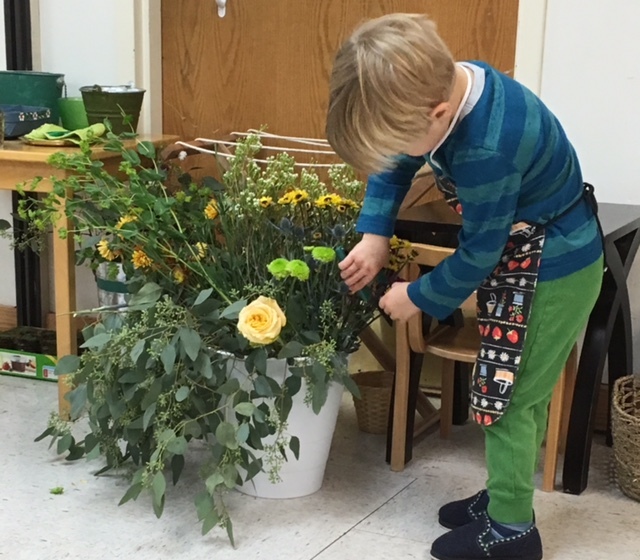 One three year old arranged several jars full of flowers and took them home at the end of the week. 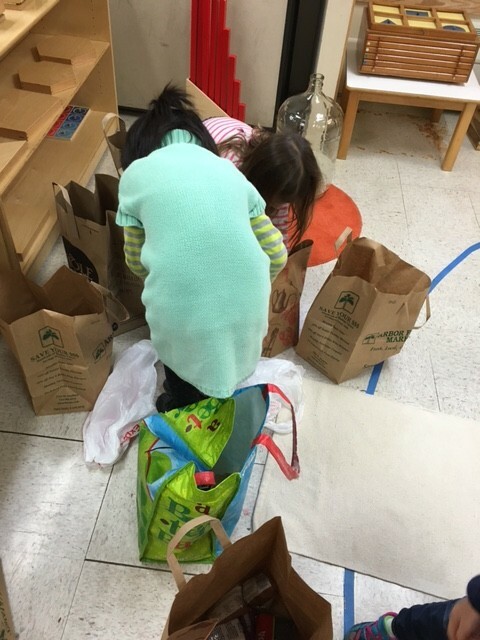 A huge thank you to Melissa for her generosity and time! 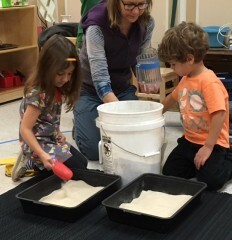 We are so lucky to have parents that are willing to share their skills with the children! 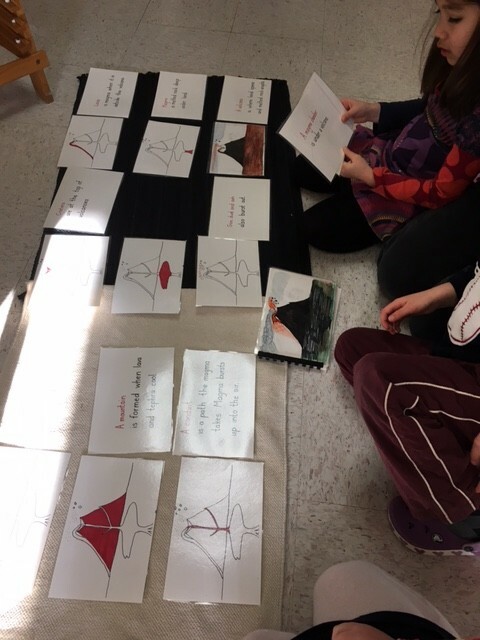 We have been thinking about simple machines lately. 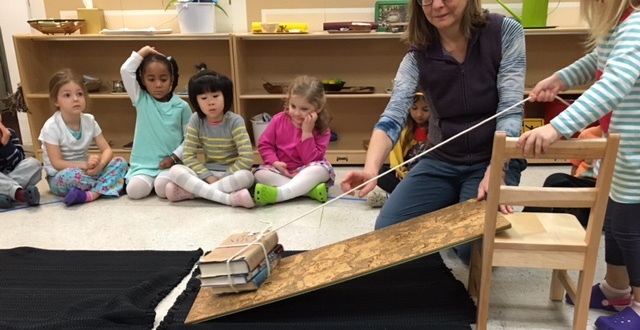 The children lifted this stack of books and then used the inclined plane to pull them up. The inclined plane of course! Tommy’s dad Eric, who is a civil engineer, came in to talk about simple machines and how we use them when building roads or parking garages. 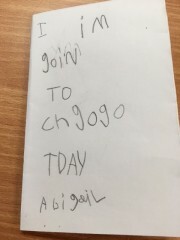 He said the first thing to do is start with a plan. Eric told us about asphalt that is made of tar, sand and gravel. 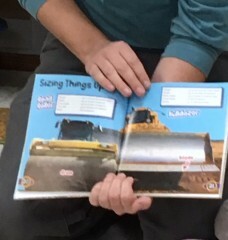 Tommy helped show pictures from a book to help us understand this process. 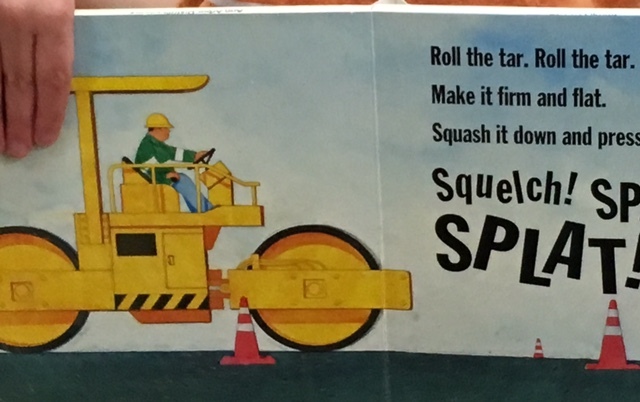 First, dump trucks put asphalt on the roads. 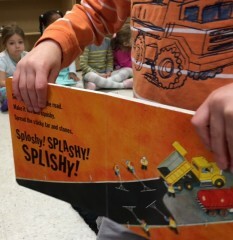 A dump truck is an inclined plane. The roller truck then flattens out the asphalt and makes it flat. 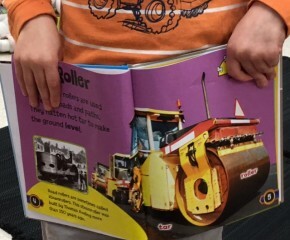 The drum rolls out the asphalt. 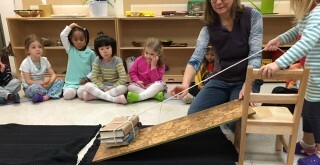 This is also a simple machine. 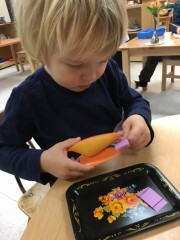 Next we had an activity. 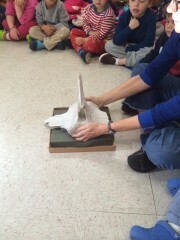 The children were able to make their own roads with a simple machine. 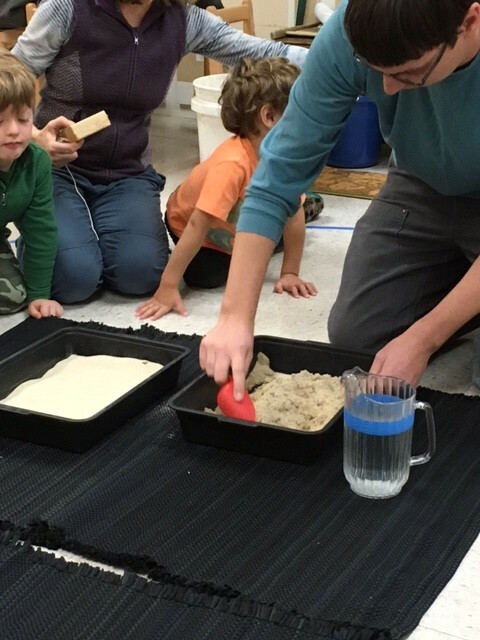 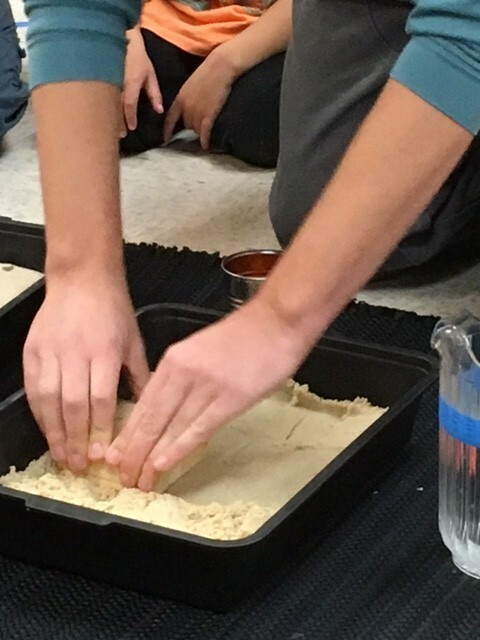 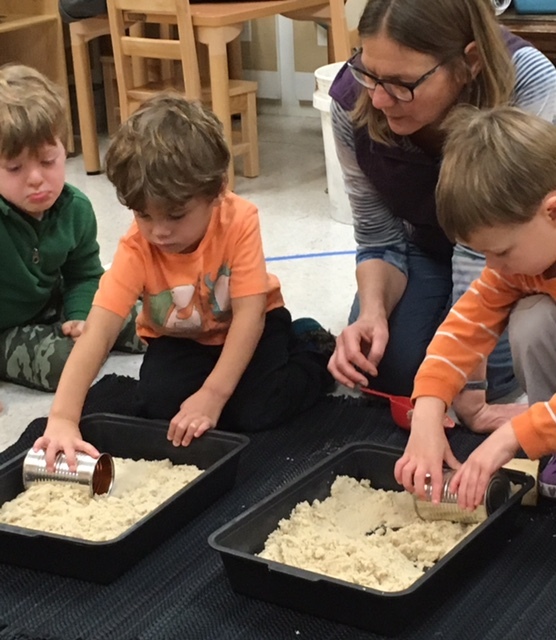 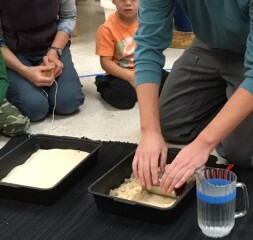 We made our own “asphalt” with sand and some water. 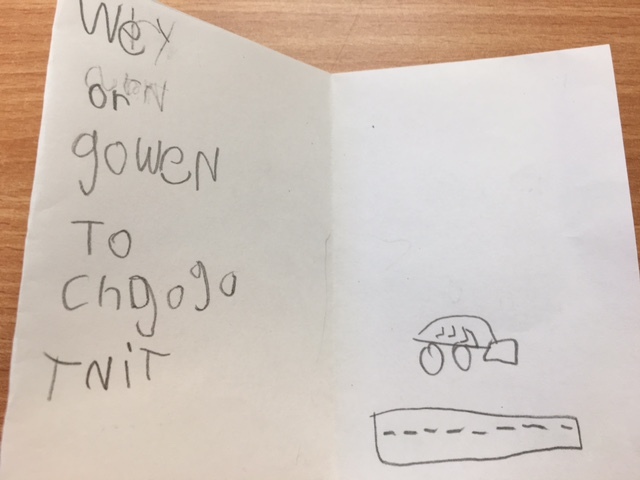 Water was added but this “road” looked way too bumpy to drive on! Eric told us how a roller works and we could see it in action. We could see that after using a roller, the “road” was flat and ready to use. Eric also used a block to stomp down the sand. 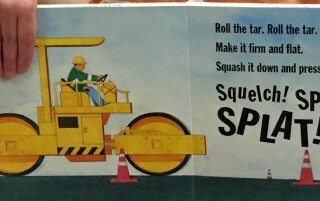 This was not as effective because it used up more energy and the road was not as level as when flattened by the roller! 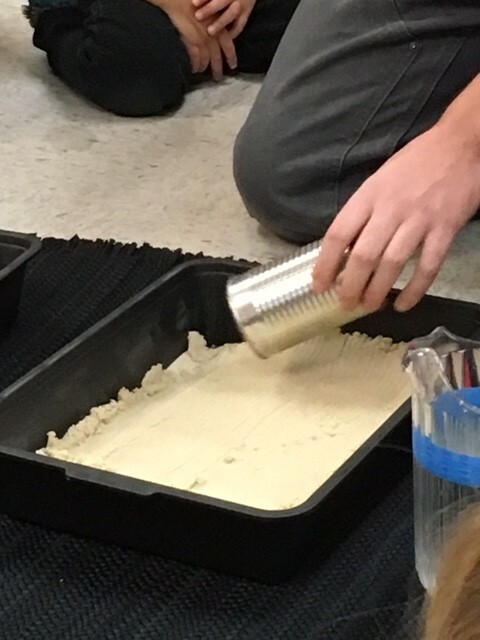 We learned simple machines are easier to use and require less energy. The children then took turns rolling over the sand to make smooth roads. Big thank you to Eric and Tommy for teaching us about simple machines!